Tallahassee, FL— Within two months of Tallahassee citizens voting via the ballot box by an overwhelming sixty-seven (67%) to end corruption in local government, Governor Rick Scott is giving a perfect example of what the citizens of Tallahassee has endured for decades—officials constantly violating laws—a breach of Public Trust. It was just November 4, 2014 when the citizens of Tallahassee elected to have an Anti-Corruption Amendment over government for many, many, many reasons. Governor Rick Scott and now former FDLE Commissioner Gerald Bailey’s “Scandal” is a prime is example of one of the reason for the amendment. According to several recent media reports, Florida Department of Law Enforcement Commissioner Gerald Bailey claimed that he was forced out of office by Governor Rick Scott. Since being ousted, now former Commissioner Bailey has alleged that Governor Scott and his aides repeatedly asked him to engage in unethical and unlawful acts during his time as the head of Florida’s Top Law Enforcement Agency. Former Commissioner Bailey has been involved in law enforcement with the FDLE for decades, yet, he waits until he’s “forced out” of office to want to begin to open his mouth—when he’s done wrong by keeping his mouth closed all of this time. Why didn’t former Commissioner Bailey, speak up when he possibly would’ve been more creditable? That’s the question reporters need to ask. In addition, with former Commissioner Bailey keeping so near and dear, the many “SECRETS” of Governor Scott’s unethical and illegal actions, who else has former Commissioner Bailey been keeping “SECRETS” about? That’s the question ALL Floridians should be asking. Here’s a starting point—Why did Commissioner Bailey refuse to investigate Leon County Sheriff Larry Campbell for breach of Public Trust, after a complaint was filed against Sheriff Campbell for allowing a family friend of the Campbell’s to work as a Leon County Sheriff’s Detective? The family friend, Donald Odham, was not a certified law enforcement officer—neither did Mr. Odham have the qualifications to work as a detective. Mr. Odham, a Tallahassee businessman who’d sold his business and seemingly had nothing else to do with his time, was presented to the court via documents and court testimonies, as a Leon County Sheriff’s Detective. While Mr. Odham was not much respected by other certified Leon County Sheriff’s Detectives/Deputies, it was his friendship with Leon County Sheriff Larry Campbell and his son, Jack Campbell, as to possibly why other Leon County Sheriff’s Detectives/Deputies and those within the Leon County Judicial System, yielded to Mr. Odham. (Fear of retaliation. Read about former Leon County Sheriff’s Deputy of the Year David Graham.) Leon County Sheriff Larry Campbell’s son, Jack Campbell, is an Assistant State Attorney/Prosecutor in Leon County (2nd Judicial Circuit). Not only does State Attorney Willie Meggs assigns cases to Jack Campbell that his dad’s office (LCSO) has jurisdiction over the investigation, but State Attorney Willie Meggs seems to formerly charge everyone presented to him by Leon County Sheriff Larry Campbell. Furthermore, Leon County and Circuit Judges seem to sign any search warrant and other court document presented to them by Assistant State Attorney/Prosecutor Jack Campbell. Clearly, Governor Rick Scott’s Administration is not the only group of people who have shown to be “spineless,” as many reporters have described them. As far as Mr. Odham and Mr. Bailey, it is unknown if Mr. Odham and Commissioner Bailey (who was also a close friend of Sheriff Campbell’s) are/were friends. But what is known is that Commissioner Bailey, Sheriff Campbell, Captain Robert Swearingen and Mr. Odham were all present at a double murder scene in January 2011. Mr. Odham worked—processing the crime scene—alongside of several of Commissioner Bailey’s FDLE Agents. No one from the District Two Medical Examiner’s Office arrived on scene. Another starting point—is the investigation of District Two Medical Examiner Associate Doctor Anthony J. Clark. Dr. Clark, who is affiliated with Tallahassee Memorial Hospital, is licensed to practice medicine in Florida and Georgia. According to Dr. Clark, he has provided expert testimony in over two hundred (200) cases. 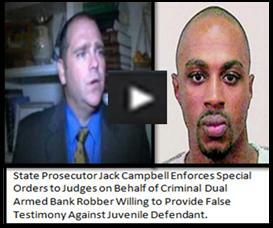 In the January 2011 double murder case of a brother and pregnant sister (State of Florida vs. DeShon Thomas), Dr. Clark was called to testify as an expert witness for Assistant State Attorney/Prosecutor Jack Campbell. Dr. Clark testified that he performed the autopsies on both victims and took samples from the female’s fetus. Although State Attorney Willie Meggs refused to allow the District Two Medical Examiner’s Office to place the victims’ autopsy reports into public record, it was learned that Dr. Clark committed perjury. In DeShon’s case process, it was clear for nearly three years, that Assistant State Attorney/Prosecutor Jack Campbell played a heavy role in the corruption that plagued DeShon’s case. Today, DeShon, who was 17-years-old and was attending Tallahassee Community College when he was charged with the murders—is without a doubt INNOCENT. The problem—for the most part, is finding a Florida attorney with a spine. One of five of DeShon’s former attorneys, Greg Cummings, conspired with Circuit Judge James Hankinson and Assistant State Attorney/Prosecutor Jack Campbell, robbing DeShon and his mother of nearly $30,000. After DeShon and his mother fired Mr. Cummings, DeShon’s case defaulted back to the court to appoint an attorney—no one had the spine to protect DeShon’s rights. DeShon’s appeals process is being conducted pretty much the same way—Conflict Counsel Jeff Lewis’ Office continues to fall short of protecting DeShon’s rights. DeShon Thomas is not the first teenager to be sent to prison for a crime that he DID NOT commit. However, it should be very sad for ALL Floridians—and the nation—to truly see elected and selected officials violating laws—publicly committing crimes—while officials know for themselves that an INNOCENT teen is in a Florida prison sentenced to Two Life Sentences plus 30 years. There are several complaints against those on the government pay role who committed a crime in order to get DeShon’s convicted. Complaints with Leon County Sheriff’s Office Internal Affairs—are going on without any acknowledgement of the complaints—they are mute. Corruption within Florida’s government is what paved the way for DeShon to be convicted. Corruption that Governor Scott’s office continues to support. How can Floridians move forward—into the 21st Century, when their constantly being pushed backward by their own local government. Dan Krassner, Executive Director for Integrity Florida, a nonpartisan watchdog group, has called on Federal Bureau Investigator, Special Agent Michelle Klimt and U.S. Attorney Pamela Marsh for Florida’s Northern District, to investigate the accusations brought forth by former Commissioner Gerald Bailey.